The California Department of Forestry and Fire Protection (CAL FIRE) has responded to fires that have burned more than 138,000 acres – almost 3 times the 5-year average for this time of year. These numbers do not include fires that have occurred outside of CAL FIRE’s jurisdiction. The Rocky Fire has been the largest so far, burning 65,000 acres in Lake, Yolo, Colusa Counties. The fire has destroyed 24 residences and 26 outbuildings and is still only 12% contained. More than 13,000 people have been evacuated. A team of researchers led by the John Muir Institute of the Environment at the University of California, Davis, have published a new journal article showing more wildfires are occurring in high-elevation forest ecosystems. These fires could speed up changes in vegetation, leaving these ecosystems more vulnerable to climate change and future drought conditions. Healdsburg is giving away recycled wastewater for free, to be used on vegetable gardens and ornamental landscaping. A new NASA study shows that, since 2012, California has accumulated a precipitation debt of about 20 inches — the average amount of annual statewide precipitation. The state’s new “SaveWater” website is up, which allows users to report water waste in their communities. 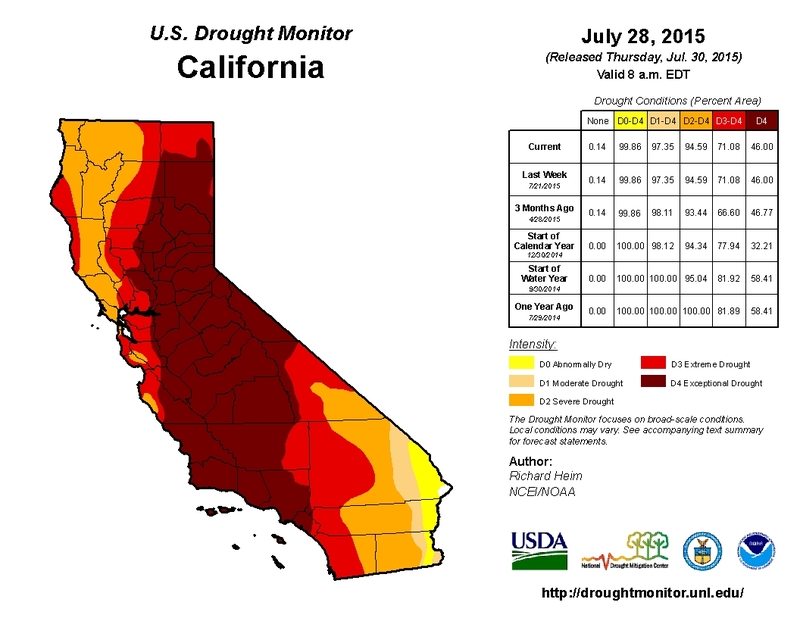 Statewide water use in June was down 27% this year from 2013. A new report from UCLA’s Institute of the Environment and Sustainability concludes that there’s no way to know how much water in California is lost to leakage and breaks, largely because the state does not require monitoring and utilities do not sufficiently invest in systems to track leaks and breaks. 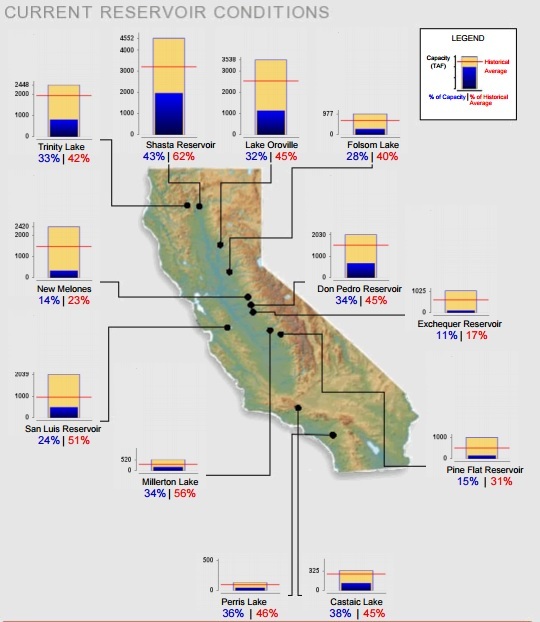 Statewide, California’s major reservoirs (representing 27.3 million acre-feet of storage) are at 33% of capacity and 49% of group average. 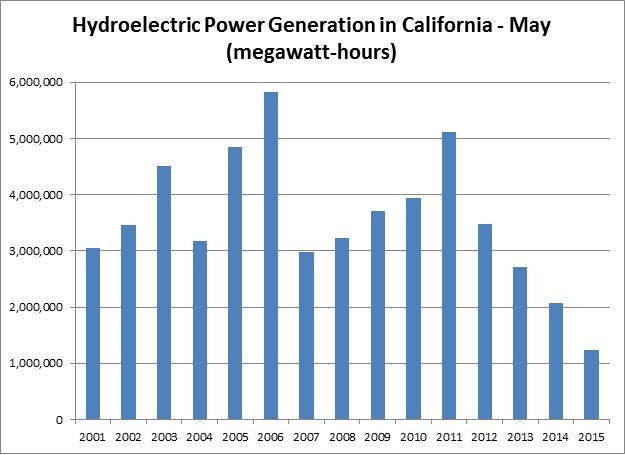 Hydroelectric power generation in May this year was 40% lower than 2014 and 69% lower than the 2003-2013 average.